DOYLESTOWN, PA— Dr. David MacDonald with Doylestown Veterinary Hospital & Holistic Pet Care recently received certification in Veterinary Spinal Manipulative Therapy (VSMT) from Healing Oasis Wellness Center in Sturtevant, Wisconsin. The Veterinary Spinal Manipulative Therapy program is a post-graduate certification approved by the College of Animal Chiropractors and the American Veterinary Chiropractic Association. The American Veterinary Medical Association (AVMA) recognizes veterinary chiropractic as a complementary and alternative treatment (CAVM) which also includes acupuncture. 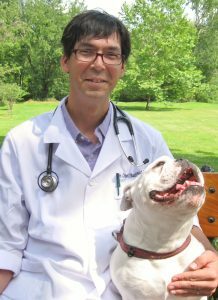 Dr. MacDonald is the only veterinarian with VSMT certification from Healing Oasis Wellness Center in the Central Bucks area. He is a graduate of Atlantic Veterinary College, University of Prince Edward Island. MacDonald has been practicing veterinary medicine in Pennsylvania for 18 years and joined Doylestown Veterinary Hospital & Holistic Pet Care in 2014. 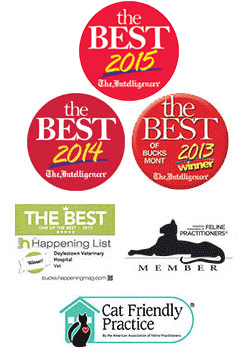 In addition to traditional veterinary medicine, Dr. MacDonald blends modern veterinary medicine with the practice of acupuncture, chiropractic and Chinese herbal medication to offer a fully integrative approach to pet healthcare. He also is member of the International Veterinary Acupuncture Society. “Dr. MacDonald is dedicated to highly individualized care especially in cases of chronic illnesses where a unique solution may be the best treatment option. We are excited to add chiropractic to our selection of holistic therapies, and his certification will be a true benefit to area pet owners who desire a more personalized approached to care,” said practice owner Dr. Laura Weis.